Nigel Hollingworth, amateur gardener, has something to brag about. First of all, his first attempt at growing a pepper plant in Somerset, England was successful. That’s pretty tough to do, given how England’s climate isn’t exactly the same as the jalapeno pepper’s natural home climate. However, Nigel’s plants aren’t noteworthy just for the fruit they bear, it’s what’s inside the fruit that has attracted attention. Nigel’s first pepper had a smiling face inside it! Not only are jalapenos good for making healthy comfort food, they’re also a food that comforts you. 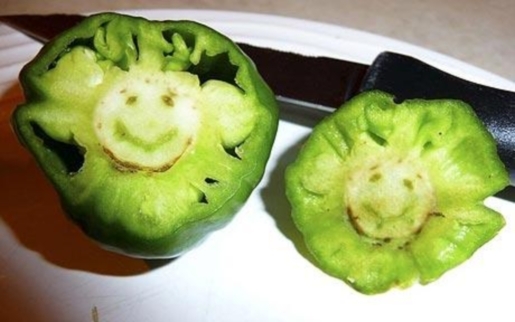 How could anyone be depressed after being greeted by a smiling pepper plant? Nobody, that’s who. Happy the Jalapeno perks up both taste buds and gloomy expressions with his spice and happy-go-lucky grin! So far, Nigel has only harvested a few peppers from the seeds he planted back in April, but he’s hoping that more peppers will yield more smiling faces. Maybe peppers secretly like England’s cool weather, and that’s what put the smile in the jalapeno’s core? There are faces hiding everywhere, if you’re willing to look for them.